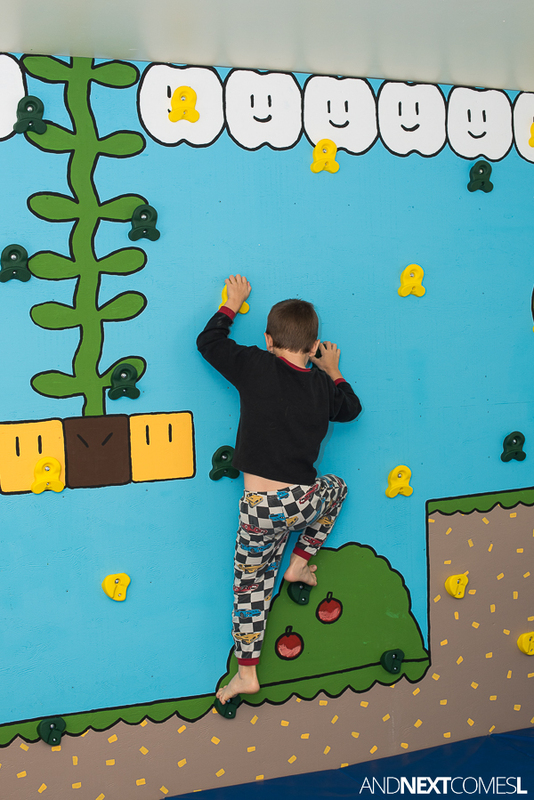 Tutorial for how to make a DIY climbing wall for kids that's inspired by Super Mario. 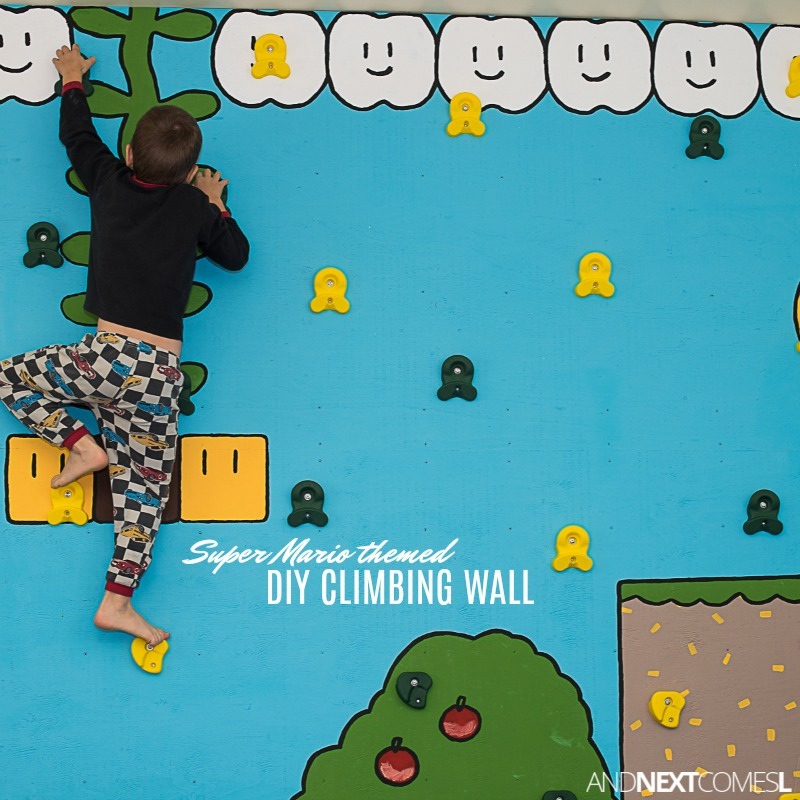 It's easy to build a rock climbing wall indoors with these step-by-step instructions and photos. Sometimes I decide to make a project and put it off for a year or two. Then when I do finally get around to tackling said project, it turns out even better than I imagined. Honestly, this project may look ambitious, but I promise, it's not. The actual building part is relatively quick. You could easily build the wall part in an afternoon. This DIY climbing wall was a project that I had been wanting to tackle for quite a few years. We found the climbing holds on sale like almost two years prior to actually building this project. So yeah, it was on our to do list for a long time! 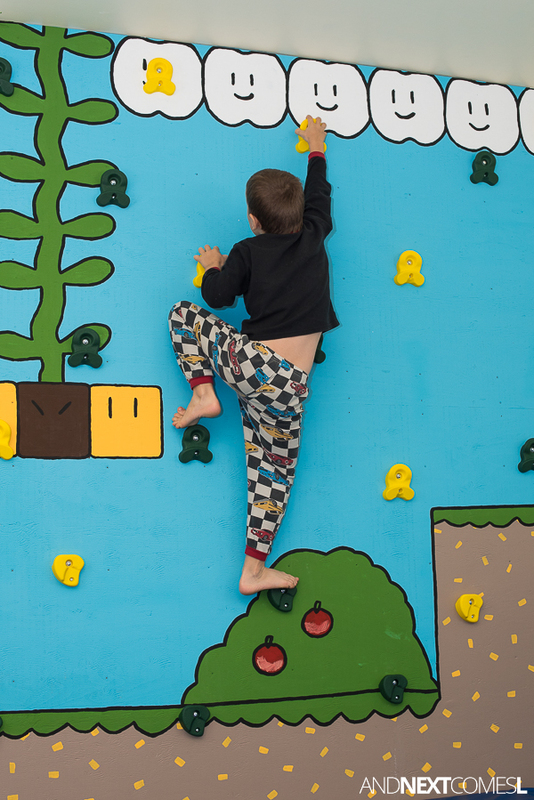 Our finished climbing wall is 8' x 8' in size. We built it from floor to ceiling in our basement. The total cost of the project was around $250. 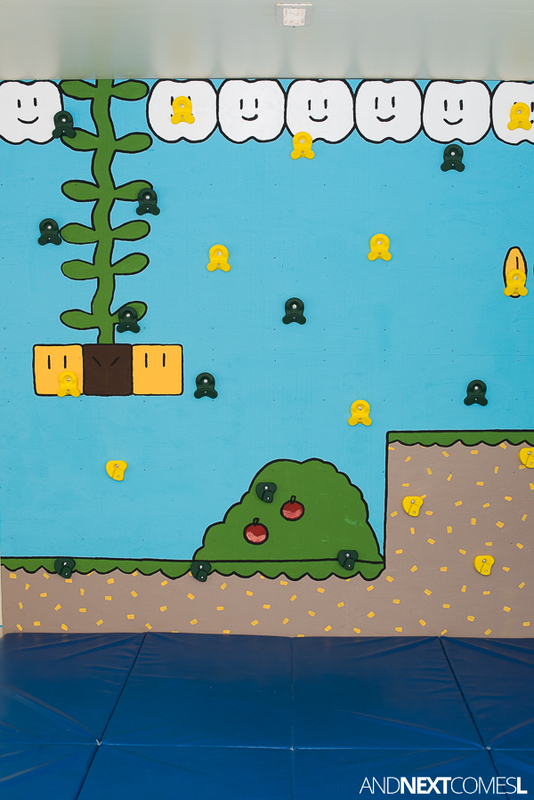 We finished the entire project in less than 24 hours - painting and all! It turned out fabulous!! I mean just look at it! Disclaimer: This tutorial is presented only as a guide. Build at your own risk. I don't pretend to be a carpenter or engineer or anything so don't blame me for things going wrong or injuries or whatnot. Okay? 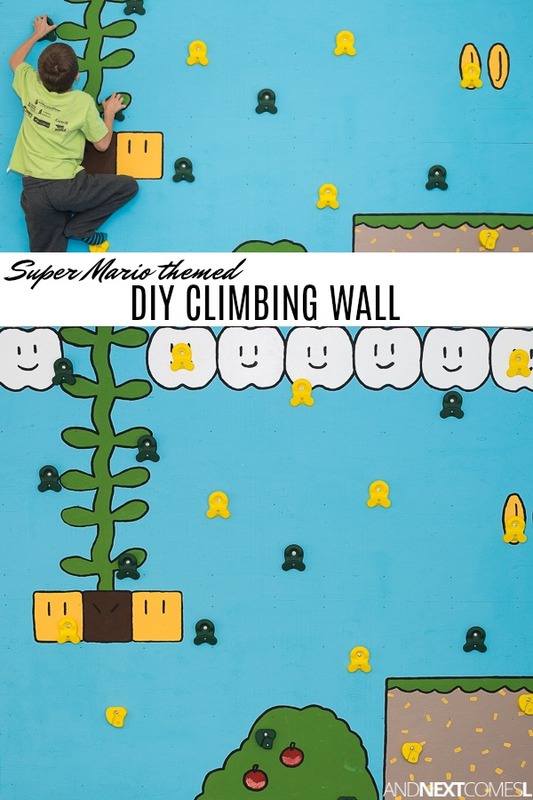 We based our climbing wall on some DIY climbing wall plans from Three Ball Climbing. It appears the PDF is no longer available on their website now. Or maybe I'm just blind...Anyway, we changed a few things about their plan since we had no intentions of moving the climbing holds around. 1. 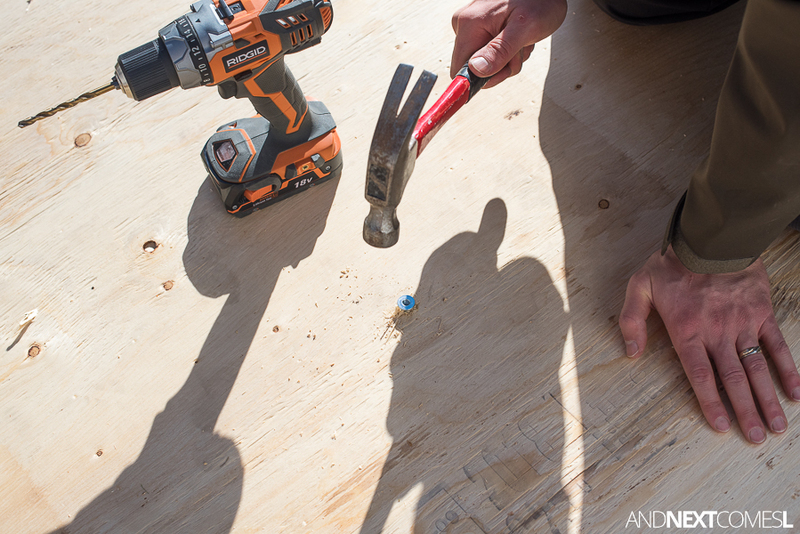 Use the stud finder to locate the left edge and the right edge of each stud. Then mark the approximate middle of each stud. 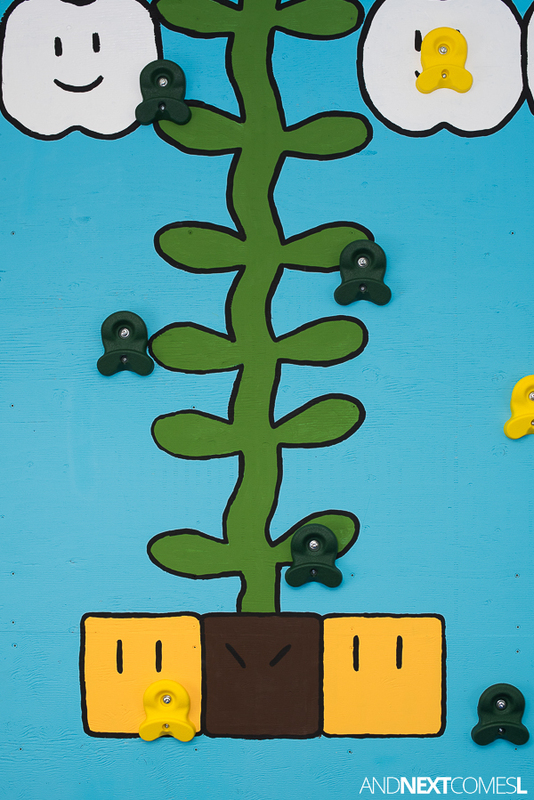 Use a 2 x 4 to draw vertical lines through the middle of each stud. You'll end up with a bunch of lines on your wall like below. 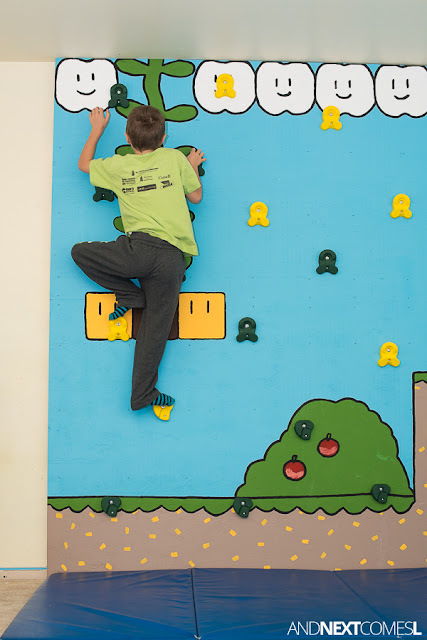 You'll noticed that we removed our baseboard for this project. Don't forget to do that as well! 2. 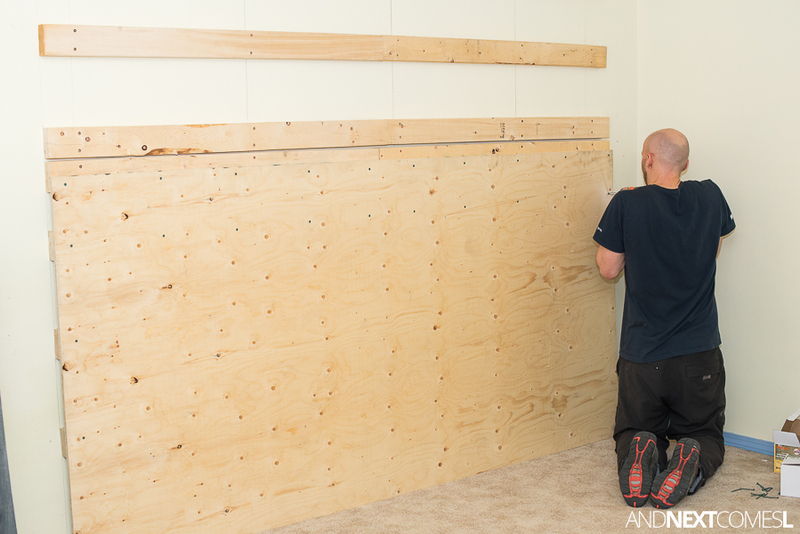 Lay one of your 2x4s along the floor at the base of the wall. See that's why we removed the baseboard...Try to get the 2x4 centered along the lines that you marked on the wall. Mark the stud at each point where the lines on the wall meet the 2x4. Drill two holes (one hole above another) at each point you marked on the 2x4. Make sure the 2x4 is level. 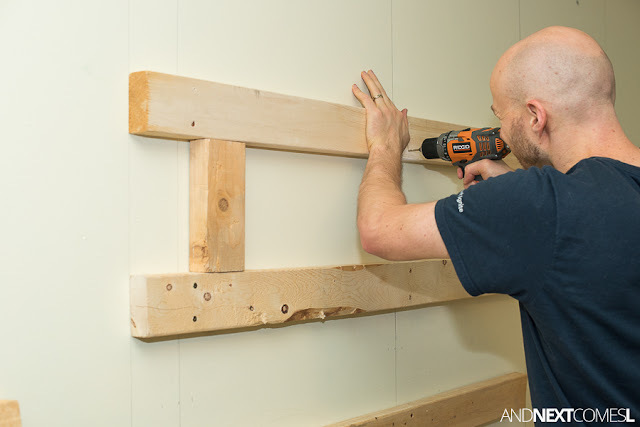 Then attach the 2x4 to the wall using the 3 1/2" screws. 3. Grab another 2x4 and your level. Line up the 2x4 vertically at the edge of the 2x4 you just attached along the base of the wall. Trace along the vertical 2x4 up to the ceiling. This line will help you line up the other 2x4s on the wall. 4. Time to make some spacers! We actually used some scrap 2x4s for this step. Make two spacers the exact same length. The plan we were following suggested 14 1/2", but I think we actually went with a slightly smaller size. I honestly can't remember! You'll use the spacers (and the vertical line you drew in step 3) to make it easier to attach the other 2x4s to the wall. 5. 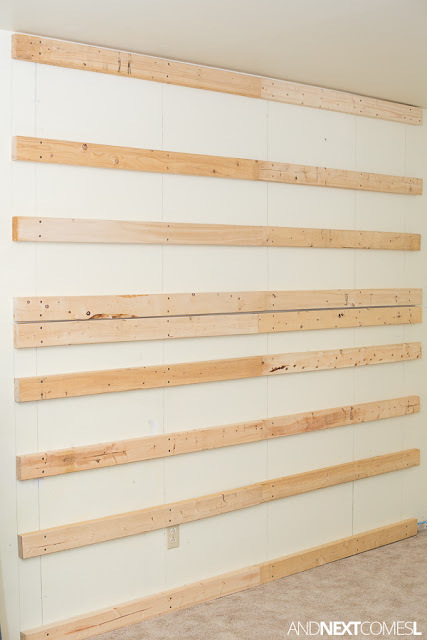 Keep attaching the remaining 2x4s to the wall using the spacers you made in step 4. Remember to use two 3 1/2" screws for each stud marked on the wall. Repeat this step until you have only one 2x4 remaining and you've built a mighty fine wall ladder. 6. In the picture above, you'll noticed two 2x4s right on top of each other near the middle. That's because that is where the one sheet of plywood will end and the other sheet will start. You need to attach a 2x4 to the wall where both sheets of plywood will meet on the wall so that both sheets can be attached to it. 7. 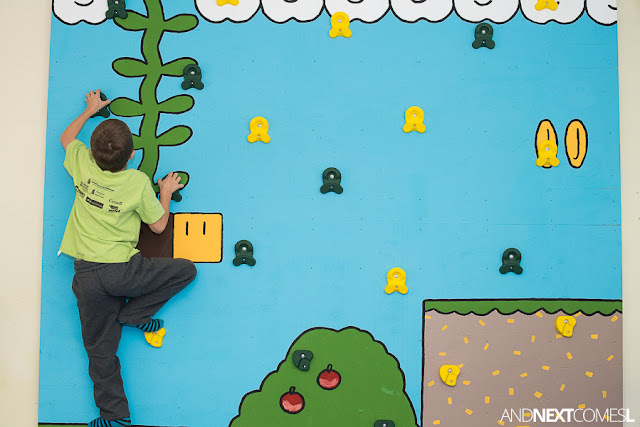 Next, you'll need to plan out where you will be attaching the climbing holds. We just placed them on the board then marked the holes with pencil. 8. 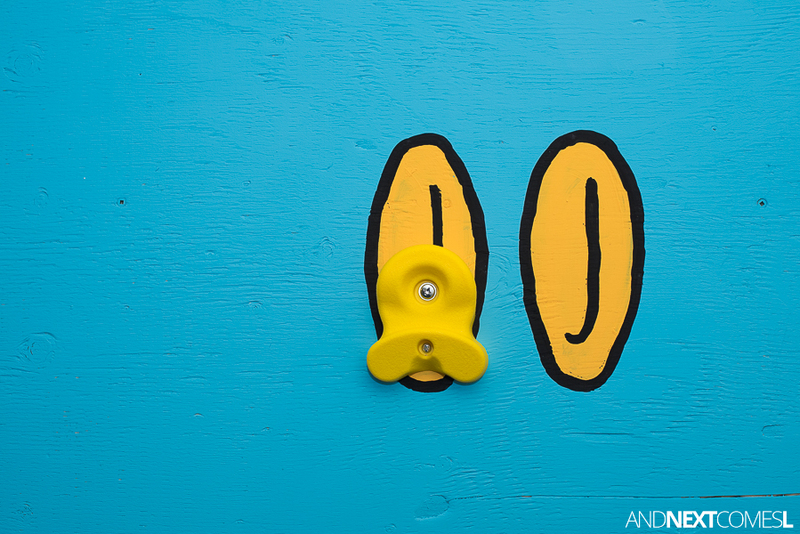 Drill holes for each climbing hold so that you can install the t nut hardware that comes with the climbing holds. You'll need to hammer each t nut into place. 9. 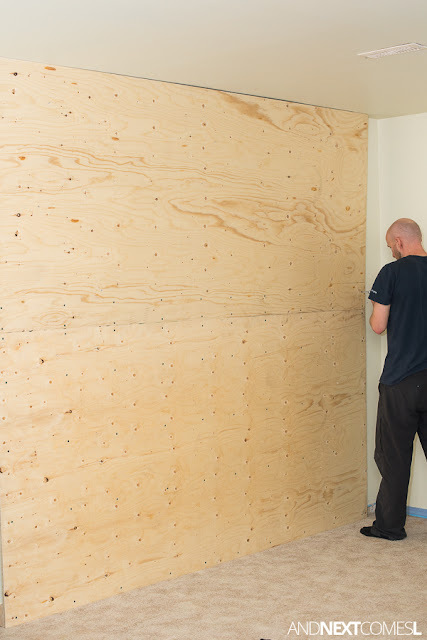 Once all the holes are drilled and the t nuts are installed, it's time to hang the plywood! 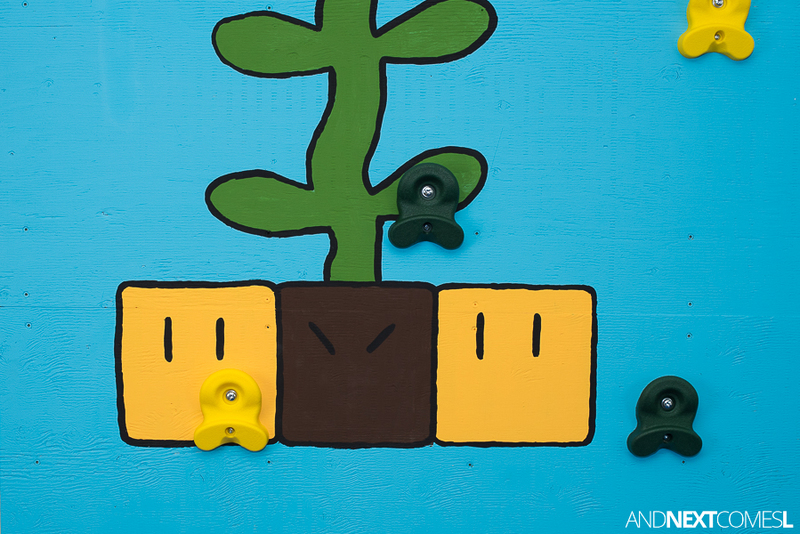 You'll use the 2" screws to attach the plywood to the 2x4 anchor studs. There's not much for painting process photos since I did a bulk of the painting. Although my Instagram story highlight (see the climbing wall highlight) makes it look like my husband did all the painting...You can tell who the picture taker in the family is. Hint: it's me. First, I planned out the basic shape of the ground that I wanted for the mural and taped out its shape using the painter's tape. Then I painted the sky blue and the ground tan. 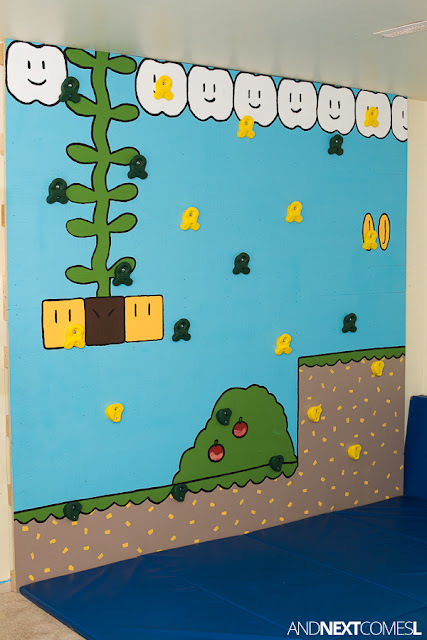 Once the paint was dry, I peeled the tape off and used a pencil to draw all the fun details like blocks and coins, etc. I made a cardstock template for the blocks. 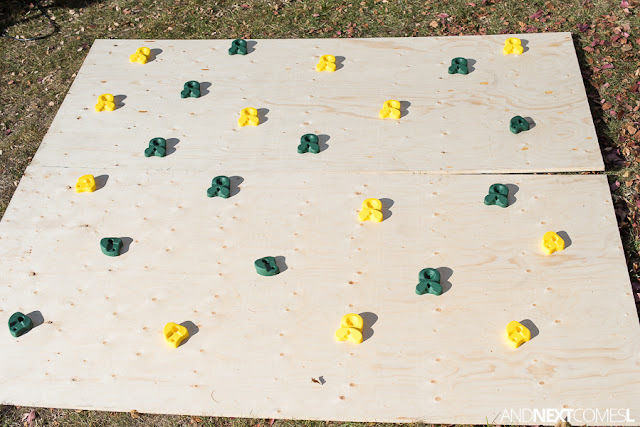 Then I traced three blocks onto the plywood. The details on the blocks were free handed. Next, I mixed all the different green acrylic paints I had on hand because my supply was a little limited and it was like 10 PM at this point...stores were closed by then so I had to make this work out! I free handed the bush and grass covering. I then also painted random yellow dashes all around the ground. Once the green was dry, I free handed the apples onto the bush. For the coins, I, once again, made a cardstock template so that they would be the same shape and size. I did the same thing for the clouds in the sky. 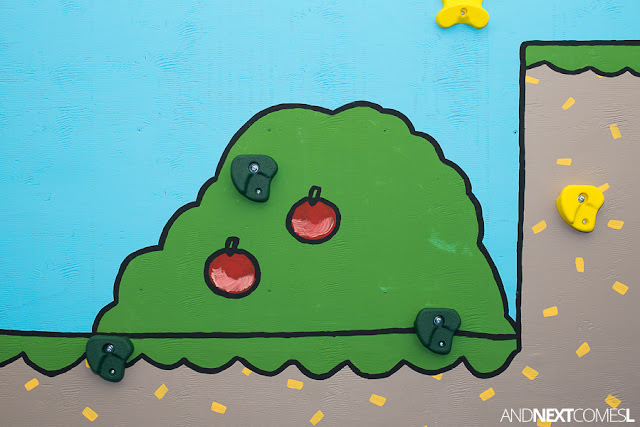 Then once all the painting was finished and dry to the touch, my husband installed all the climbing holds. 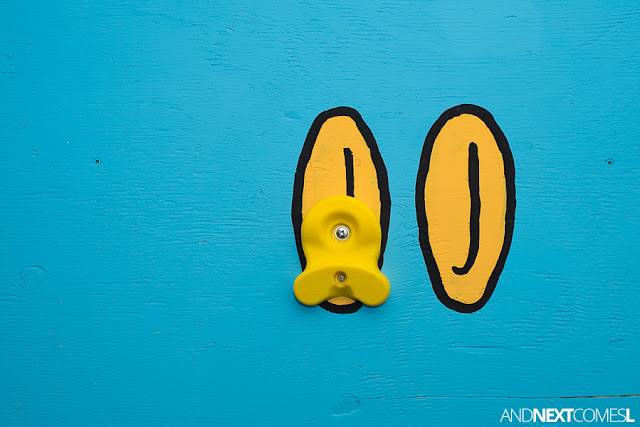 Each hold is held up by the included t nut hardware and a 2" screw. Shall we recap with a quick video overview? Yep, let's DO IT! The Finished Product is Pretty Super! 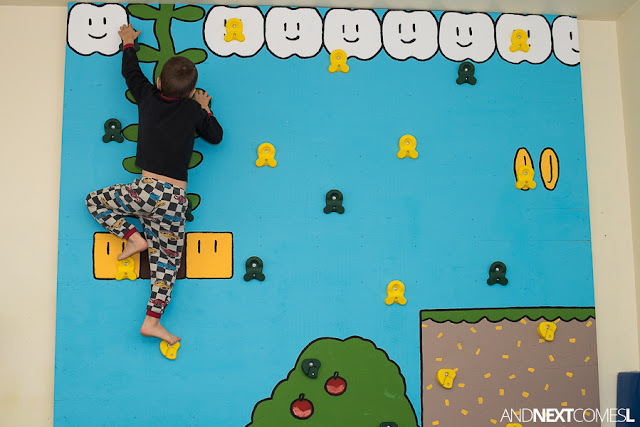 When the boys woke up the next morning, they were eager to try it out! Here are a few (of the hundreds!) of photos that I took of the first few climbs. Hey, just be happy I narrowed it down to this many!